SiteGround’s reseller hosting program is created for web designers and developers that maintain their customers’ websites on a long term basis. It’s designed to make it easy to include a highly reliable web hosting as part of your service and increase your revenue at the same time. Reselling with SiteGround works differently than other hosts. They have a credit system in place, which I will explain below. For a full list of features of their reseller hosting accounts, you can refer to this page. The first thing you do is sign up and buy a minimum of 5 credits, where each credit is equal to one year of hosting (note that reseller credits never expire). The more credits you buy, the cheaper things get. That means that to start off you will need €180 (5X36). That includes 5 StartUp shared plans for a total of 50 GB hard drive space. Each plan can take up to around 10,000 monthly visitors and includes free domain names, free setups & transfers, free CloudFlare CDN, daily backups, cPanel & SSH Access, and more. Another alternative with SiteGround is to use their cloud hosting and reseller accounts from that platform. This is ideal if you have many clients, say more than 20. HostNine is another host I’ve relied on for a long time. They respond to questions quickly and professionally. Although they don’t offer specific WordPress hosting, the reseller hosting they offer is really awesome, especially for those who have international clients, as you can easily migrate server locations at the click of a button. They have 5 dedicated reselling plans which shows that reseller hosting is a big part of their business. 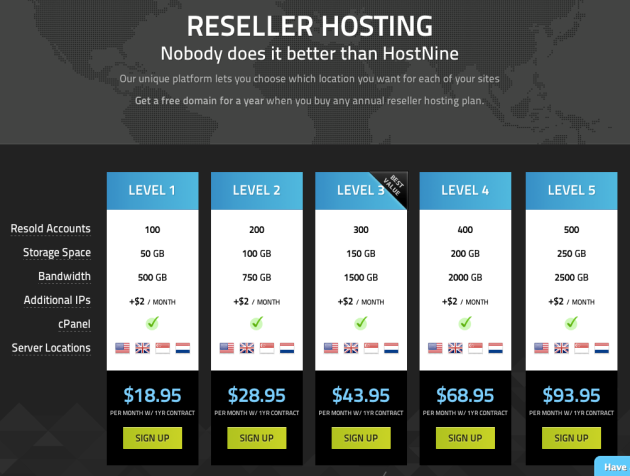 You can easily scale your reseller hosting business with HostNine, so if you’re really going for it, this is a very good choice. NameCheap provides cPanel / WebHostManager reseller hosting powered by high performance SSD reseller servers. You can host multiple websites or become your own hosting reseller today with Namecheap’s reseller hosting. All the NameCheap reseller hosting plans cost just $1.00 for the first month then renew at regular rates. In the long term, this works out to $14.95 per month. A2 Hosting are a reliable host you can trust with your clients’ websites. They use a high-performance platform called SwiftServer and provide many features in each of their three reseller hosting plans. Although not specifically for WordPress, they do mention that their reseller accounts are recommended for WordPress. 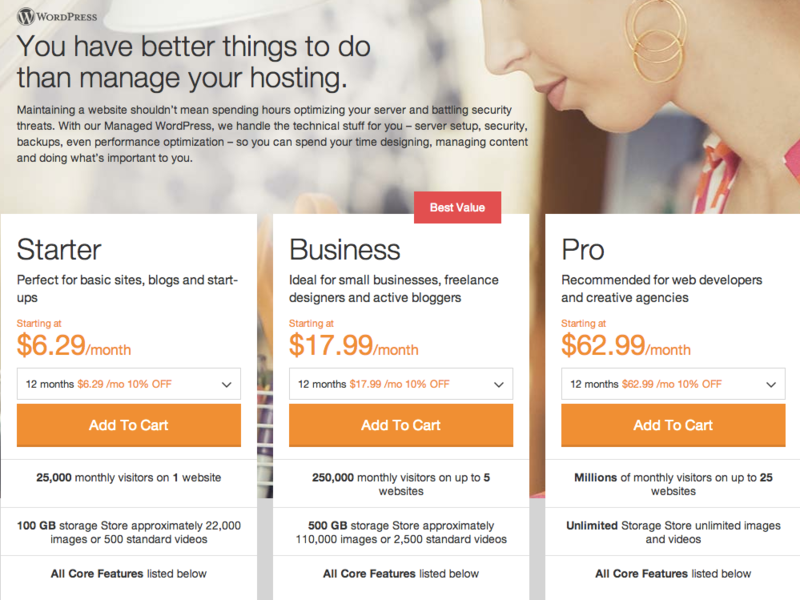 Oh, how about namecheap, the best reseller host if you ask me, for just $14.95 a month. They’re great too, thanks for reminding me to add them to this list. Their credit system is honestly kind of pointless, which I hate to saay. I’ve attempted to use it in the past and if a client wants multiple sites and/or hits their Inod usage limit, I’ve simply had to upgrade them from a Reseller account to a standard hosting account, which invalidates the credit system. On that same point, their Reseller page doesn’t mention Inod usage at all. It’s misleading for them to say that a site can have unlimited visitors. That may technically be true, but it’s not true in practice because once you start getting about 4000+ visitors per month who actually browse your content (even if you have a smaller WP site) you hit your Inod limit for the month and have to upgrade in order to keep your client’s site from flat-lining. Thank you for pointing this out – the article indeed has some inaccuracies. We are sure that the author of the review will make sure to correct this. We want to clarify the benefits of the reseller program and straighten things out on the usage tracking questions you have raised. The main benefit of the reseller program is that it allows you flexibility to activate accounts on behalf of your clients whenever you need them. It is a great fit for a business model where you have clients with smaller websites and you need access to them since you also perform additional services for them. The option to buy credits in bulk and the fact that the price per credit stays the same for the entire period you host with SiteGround, make it possible to generate substantial profit in the long run. The main reseller page does not go into technical data such as Inods, yet we have a more detailed feature description for the reseller credits https://www.siteground.com/reseller/features.htm and there under server details we provide technical specifications for the reseller hosting account including Inods. We also want to point out that the each site is different and the amount of traffic it can accommodate depends on the resources each visitor is using. When the code for the website is well optimized, fewer resources per visitor are used, which makes it possible to handle a large number of visitors. When the site is not coded efficiently, the number of users it can handle smoothly will be less. We acknowledge that we had launched the reseller program a while ago when we offered only a single plan. Back in those days its features provided a lot of value. We know there is a big interest in upgrading the program to add benefits for using the higher plans we offer, yet this process takes time, and we will be working on that. HI there, we’ve updated the post above with the correct information. Can you please confirm that it’s as stated on your site? What about inmotion hosting or greengeeks? Thanks for comparison and information. How about Itabix Inc?